Historical Background of the Book. See the historical background to the book of Daniel. The Author and the Audience. The Babylonians carried Jewish captives back to Babylonia in three waves. Among the roughly 10,000 Jewish people taken captive in the second deportation of 598 B.C. was Ezekiel, whose name means "God is strong". He was a married Levite (his wife died around 588 B.C.). Ezekiel's primary audience was his fellow Jews in exile, although the book also contains prophecies for a number of other nations. From roughly 592 to 570 B.C., he would write some of the most graphically detailed and challenging prophetic imagery in the Bible. It is comparable in complexity to that written by Daniel as well as the New Testament Apostle John in the Book of Revelation. Outline/Major Themes. 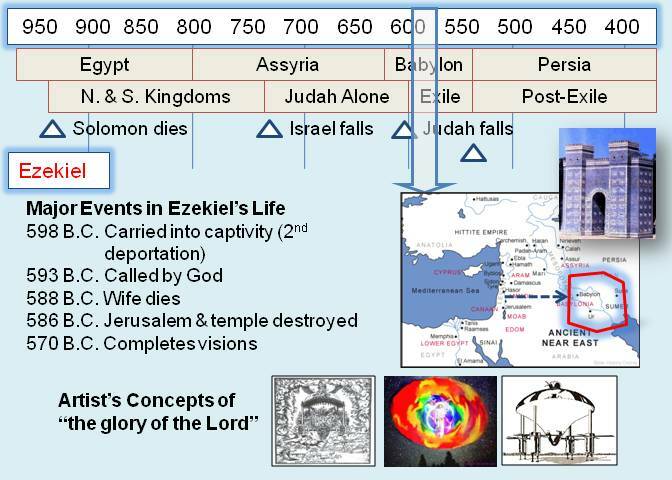 The book of Ezekiel is written from Ezekiel's perspective (in first person singular). Despite the complex imagery of the book, the major themes are relatively simple and found repeatedly in previous prophetic books. First vision, "the glory of the Lord" - a flying complex of four winged creatures, wheels, a crystal-like expanse, a throne-like platform on top, and a man-like figure. Ch. 25 - 32 God's judgment against the heathen nations Judah would try to align with against the Babylonians (e.g., Ammon, Moab, Edom, Philistia, Tyre, Sidon, Egypt). Ch. 38 - 48 The eventual triumph of God's people over her enemies - visions of the valley of dry bones, Gog and Magog, physical restoration of the temple, animal worship, and the land - the spiritual triumph of the church. The ultimate triumph of God's people - One way or another, the children of God will ultimately triumph over their enemies. Physically viewed, the repentant Jews would eventually be allowed to return to the Promised Land, rebuild the temple, and restore worship. Spiritually viewed, Jesus' church would eventually triumph over the forces of Roman paganism and religious oppression.